Aunt Sally Good Food: Have you tried the fried butter? Culinarily speaking, it seems the question on everyone’s lips this year is “Have you tried the fried butter?” It’s been covered by every major news source. Shoot. Even David Letterman has a top ten list for it. They’re asking about the Winner of Most Creative in the Big Tex Choice Awards competition. Every year, the State Fair of Texas holds a contest among its vendors. This year, Abel Gonzales' fried butter is getting all the buzz. Mr. Gonzales is the creator of fried coke and fried peanut butter and jelly sandwiches. 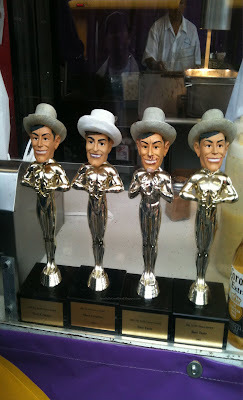 His booth is lined with Big Tex award statues. The man is held in high State Fair reverence, second only to Big Tex himself. But what does fried butter taste like? Your Auntie will tell you. Firstly, it is not at all as one would expect. You were expecting a big lump of grease weren’t you? Nope. Not going to get it. That will relieve some; disappoint others. Dough is wrapped around a piece of frozen whipped butter. The dough is then fried. The butter melts into the dough, giving it a rich flavor, but hardly noticeable. The fried dough balls are dusted with powdered sugar. The dough itself is rather plain, with a pleasant slight saltiness. The saltiness compliments the sweetness of the toppings. The toppings, in fact, give most of the flavor. They come in original (dusted with powdered sugar), cherry, grape or garlic. “Garlic? !” you say. Yes, garlic. I’ll get to that in a minute. Standing in line, I noticed the sauce seemed a lot like cherry or grape jelly. I had feared it would be some sort of neon fruit-like substance. However, it looked quite tasty and I decided to go for the cherry. I was glad I did. 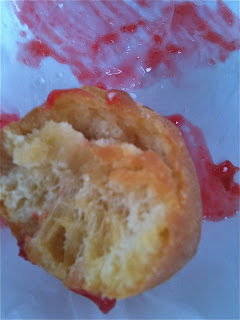 The slight saltiness of the dough underscored the tart sweetness of the cherry sauce. I expected a little puddle of butter to ooze out of the center. However, the butter melted into the dough. As you can see in the picture, there is no hole where the butter once resided. After tasting them, garlic seemed like a very good idea. I imagine it will taste much like garlic bread. I’ll have to try that the next time I go to the State Fair. All in all, they remind me of buttery beignets, but with a slightly firmer dough. They come four to a basket at a cost of four dollars. Mr. Gonzales’ stand is located on Nimitz Drive and open only during the duration of the fair.